Thailand commercial beekeeping has faced many disease problem from bacteria, virus and parasites mites. There aretwo main mite infections in Thailand, such as Tropilaelaps and Varroa mites. They are important for honeybee health. And mite-related virus infection is one of the economic losses factors of commercial beekeeping in Thailand. In this study, we detected virusesfrom thirty Tropilaelaps and Varroa by using the RT- PCR in Chiang Mai. Tropilaelaps and Varroa samples were detection with seven honey bee virus such as DWV, ABPV, CBPV, VDV-1, SBV, KBV and BQCV. We found that Tropilaelaps have infected four honey bee viruses, such as DWV, ABPV, CBPV and VDV-1. At the Varroa mites, there have three honey bee virus infected such as DWV, ABPV, and VDV-1. VDV-1 is the first detection in Chiang Mai, Thailand. The percentage detection of DWV and ABPV were 100 and VDV-1 was 77 in Varroa mites. And the Tropilaelaps mites, there was 100% infection of DWV, 57% of ABPV, 30% of CBPV and 23% of VDV-1. When compared the virus infection between Tropilaelaps and Varroa mites, Tropilaelaps mites have more virus infection than Varroa mites. Thailand is a tropical country having different vegetation with diverse flora blooming in all seasons (Oldroyd and Wongsiri, 2006). Especially in the north of Thailand, there are plenty of nectar resources and suitable climate for beekeeping. However, the climatic conditions also favour for pest population and bee disease. (Chantawannakul et al., 2015). European honey bee, Apis mellifera L. was introduced to Chulalongkorn University, Bangkok Thailand in the early 1940s by Supachai Wattana. In 1953, Saman Worakitta, introduced European honey bee from Australia to Kastsart University, Bangkok Thailand (Wongsiri, 1988). In 1970s, there were imported large numbers of A. mellifera from Taiwan to Lamphun and Chiang Mai in northern Thailand for commercial purposes (Wongsiri et al., 1995; Akratanakul, 2000). A. mellifera beekeeping was spread out in northern Thailand, especially in Chiang Mai province (Thapa and Wongsiri, 1997). European honey bees in Thailand have mostly infected by Varroa and Tropilaelaps mites. Honey bee viruses such as Acute Bee Paralysis Virus (ABPV), Deform Wing Virus (DWV), Black Queen Cell Virus (BQCV), Kashmir Bee Virus (KBV), and Sacbrood Virus (SBV) were detected on Tropilaelaps mercedease (Khongphinitbunjong et al., 2014). Varroa mites infected colonies have followed bee virus diseases occurred especially in northern Thailand (Sanpa and Chantawannakul, 2009). Tropilaelaps mites are primary brood ectoparasites of the giant Asian honeybees (A. dorsata and A. laboriosa) (Delfinado-Baker et al., 1989). The mites can only survive in colonies with the presence of brood in which they readily feed and reproduce inside the cells, and they can live 1-3 days on adult bees (Kitprasert, 1984; Woyke, 1984; Koeniger and Musaffar, 1988; Rinderer et al., 1994). Tropilaelaps mites infected to A. mellifera when imported to Asia regions. The first reports identified Tropilaelaps clareae was the most serious parasite of A. mellifera colonies in Asia (Burgett et al., 1983, Morgan, 2007) and there has most serious threat to A. mellifera colonies in the Philippines (Cervancia, 1993). Varroa mites are originally parasitized mites from the Asian honey bee (Apis cerana) (Anderson and Fuchsm, 1998; Anderson, 2000; Anderson and Trueman, 2000). And Varroa destructor is the most important pest of A. mellifera and it plays a main role to losses of honey bee colonies (Crane, 1978; Martin, 2001). Varroa females entering to the brood cells and reproduce on the worker or drone larvae about 20~40 hrs before the cells are to be sealed (Boot et al., 1992). The adult female mites and progeny feed on the haemolymph of pupae from a single feeding site (Kanbar and Engels, 2003). Many kinds of bee virus are related with honey bee mites such as Varroa and Tropilaelaps mites. DWV, BQCV, SBV, KBV, ABPV, and Chronic Bee Paralysis Virus (CBPV) are found in Tropilaelaps mites infected colonies (Forsgren et al., 2009; Dainat et al., 2009; Chanpanitkitchote et al., 2017). DWV, ABPV, CBPV, BQCV, KBV, SBV, Varroa Destructor Virus-1 (VDV-1) and Slow Bee Paralysis Virus (SBPV) are generally found in Varroa mites infected colonies (deMiranda et al., 2011; Francis et al., 2013; Moore et al., 2015; Roberts et al., 2017). Varroa destructor virus-1 (VDV-1) is genetically closely related to DWV but is reported to be more specific to V. destructor than to bees (Ongus, 2006). In this study, we have taken the Tropilaelaps and Varroa mites detection with seven honey bee viruses. Adult female Tropilaelaps (T. mercedease) and Varroa mites (V. destructor) were collected from sealed brood of Apis mellifera in apiaries where located at Chiang Mai and Nan province Thailand from April to June 2017. Total of 30 Varroa and 30 Troplaelaps mites were collected and all the mites were placed in Eppendorf tube and put on icebox for 24-hour safe carrying (Miranda et al., 2013). All mites samples were kept in refrigerator at -40°C deep until RNA extraction procedure was carried out. The total RNA was extracted from individual frozen adult female Tropilaelaps and Varroa mites using RNA isolation kit TRIzol (Invitrogen) according to manufacture protocol, 1ml of TRIzol (Invitrogen) reagent per 50~100mg of honey bee tissue or one bee mites was used for homogenization. Then 0.2ml of Chloroform was added per 1ml of TRIzol reagent used for homogenization, 0.5ml of 100% isopropanol and wash RNA with the 1 ml of cool 75% ethanol. Then RNA samples were dissolved in DEPC treated water and stored at -40°C deep freezer until PCR action. For the first standard cDNA synthesis system used Invitrogen Super Script RT-PCR kit. Prepared the new 0.2ml of sterilized PCR tubes and the Invitrogen cDNA extraction kits procedure. For the first standard cDNA synthesis system used Invitrogen Super Script RT-PCR kit. In the order to synthesize cDNA, 3μl of total isolated RNA was mixed with 1μl of Oligo (dT) 20 50μM, 1μl of 10mM dNTP mix and 5μl of DEPC treated water (OminiPur, USA). Then incubated at 65°C for 5 min. And add 2μl of 10x RT buffer (200mM Trics-HCL(pH8.4), 500mM KCL), 4μl of 25mM MgCl2, 2μl of 0.1M DTT, 1μl of RNaseOUT TM and 1μl of Super Script® III RT and incubated at 50°C for 50 minutes and 85°C for 5 minutes. Finally add 1μl of RNase H and incubated at 37°C for 20 minutes. And cDNA samples were Kept at -20°C for PCR amplification. PCR was conducted using with 1μl of cDNA sample, 1μl of 25 nmole DNA oligo primers 1.0μM of each forward and reverse primer. Then adding the 0.25μl of Taq (Invitrogen) DNA Polymerase Recombinant, 0.25μl of 10mM dNTP, 0.75μl of 50mM MgCl2, 2.5μl of 10x PCR buffer and sterile distil water were add to total 25μl. PCR reaction was performed using an initial denaturation of 10 min at 95°C. Followed by 40 cycles of 10s at 95°C, annealing step of 16s at 60°C, and extension for 20s at 72°C and Final extension of 10 min at 72°C. PCR product were analysed by the gel electrophoresis. Gene bank accession number for sequence phylogenetic analysis used ABPV for HQ877399, DWV for KT733632 and VDV-1 for JX661646. After analyzing thirty Tropilaelaps and Varroa mites RNA, all the seven honey bee virus were detected. Tropilaelaps mites were found to be infected with four honey bee virus i.e. i.e. DWV, ABPV, CBP V and VDV-1and Varroa miteswere infected with three virus viz. DWV, ABPV, and VDV-1. The rate of infection was found as follows: DWV by100%, ABPV by 57%, CBPV by 30%, and VDV-1 by 23% in Tropilaelaps and DWV and ABPV by 100% and VDV-1 by 77% in case of Varroa However, the number of virus infection of Varroa are more infected than Tropilaelaps mites. The virus combine infection in the same mites have occurred 2 to 3 virus infections (Table 1). Then three common viruses such as DWV, ABPV and VDV-1 infected samples from Varroa and Tropilaelaps mites were chosen for sequencing. In addition, analysis with 3 database samples gene bank and 6 research samples by using Mega. 7.0 software. There have neighbouring joint analysis data showed Varroa VDV-1, Tropilaelaps VDV-1 are 31% closely each other. Varroa ABPV are closely gene bank ABPV data samples HQ877399, but Tropilaelaps ABPV is closely with gene bank DWV database sample KT733632. The VDV-1 and ABPV samples are closely in the tree. 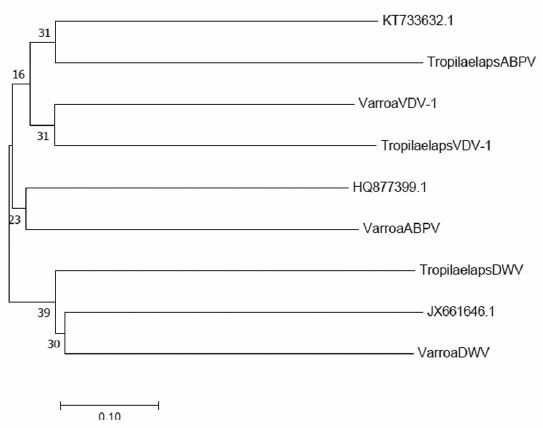 The Tropilaelaps DWV and Varroa DWV closely with gene bank database JX661646 (Fig. 1). Neighbouring joint analysis of VDV-1, ABPV and DWV from Varroa and Tropilaelaps mites with database samples KT733632, HQ877399 and JX661646 from gene bank. Varroa mites can be transmitted several viruses such as DWV (Bowen-Walker et al., 1999), ABPV (Ball, 1983), KBV (Chen et al., 2004; Shen et al., 2005) and IAPV (Di Prisco et al., 2011). Varroa mites were a vector of the DWV in A. mellifera (Chen et al., 2006; Santillan-Galicia et al., 2008; Martin et al., 2013). In 2009, Sunpa et al. reported there was four virus infected such as ABPV, DWV, KBV, and SBV to varroa mite from northern Thailand. In this research, we found that varroa mites have three viral infections: DWV, ABPV, and VDV-1. DWV and ABPV were same as them, but we did not found KBV and SBV. We have new virus strain VDV-1 was found in Varroa mites. Nobody report that virus was found in Chiang Mai before our research. According to the research, one varroa mite can carry more than two to three virus strains and it becoming a vector for bees and transmitted virus diseases to the bees (Wilfert et al., 2016). The Tropilaelaps mites were related with deformed wings virus infection of adult honey bee workers (Burgett et al., 1983) and they are the vector of DWV, which can be transmitted during the feeding activities (Forsgren et al., 2009; Dainat et al., 2009). Tropilaelaps mites were associated with DWV in Apis mellifera reported in China (Forsgern et al., 2009). In this research, we found that Tropilaelaps mites have infected four viruses infection, such as DWV, ABPV, CBPV and VDV-1. Therefore, one Tropilaelaps mite can carry more than two to four virus strains and they s carrying virus like a vector and transmitted to honey bee pupa and larval stages in the colonies (Dainat et al., 2009; Khongphinitbunjong et al., 2015). Both Varroa and Tropilaelaps mites were feeding the haemolymph of bees, although the Varroa mites can harm to the adult bees, Tropilaelaps mites cannot harm to the adult bees (Koniger, 1988). Tropilaelaps mites feeding on honey bee pupa and larval stages in the colonies (Koniger, 1993). Tropilaelaps mites are more population than Varroa mites in Thailand. Heavy Tropilaelaps mite infection can be destroyed the brood stage of bees colonies (Buawangpong et al., 2015) and mites follow up virus infection leads to the economic losses of beekeeping condition (Zemene et al., 2015). I would like to thanks to who support to this research Agricultural Interdisciplinary Program, Graduate School, Maejo University, Chiang Mai, CP group Col.td and Syngenta group. Then I would like to Thanks to my supervisor Professor Dr. Siriwat Wongsiri, my supervisory committees Dr. Parawee Kanjanaprachoat, Dr. Tipwan Suppasat for their kindly supervised and support to me. And also thank to Prof. Dr. Nikolaus Koeniger for his guidance for this paper. Kiprasert, C., (1984), Biology and systematics of the parasitic bee mite Tropilaelaps clareae Delfinado and Baker (Acarina: Laelapidae), MSc thesis, Kasetsart University, Bangkok, Thailand. Moore, P.A., Wilson, M.E., and Skinner, J.A., (2015), Honey bee viruses, The Deadly Varroa Mite Associates, Bee Health, 19, p2015. Winston, M.L., (1992), The honey bee colony: Life history. The hive and the honey bee Hamilton Illinois: Dadant & Sons Graham JM, Apicult. Res, 37, p69-78. Woyke, J., (1985), Tropilaelaps clareae, a serious pest of Apis mellifera in the tropics, but not dangerous for apiculture in temperate zones, American Bee Journal, 125, p497-499.